It was one of those bleak, damp days where spring was masquerading as fall. Not much was going on in my world. 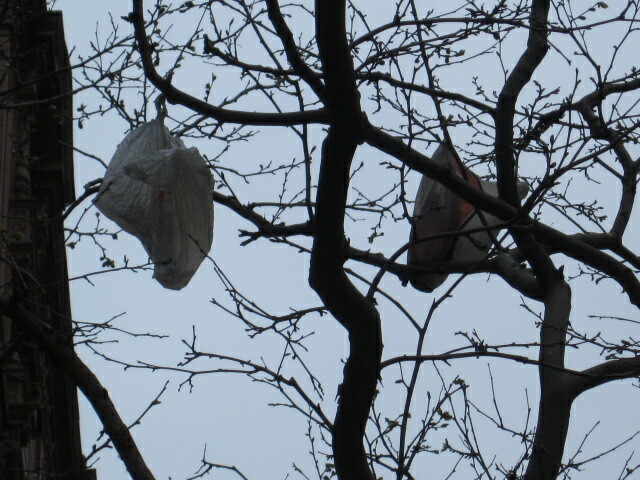 I looked up at the tree on my block with the two bags still tangled in the branches. 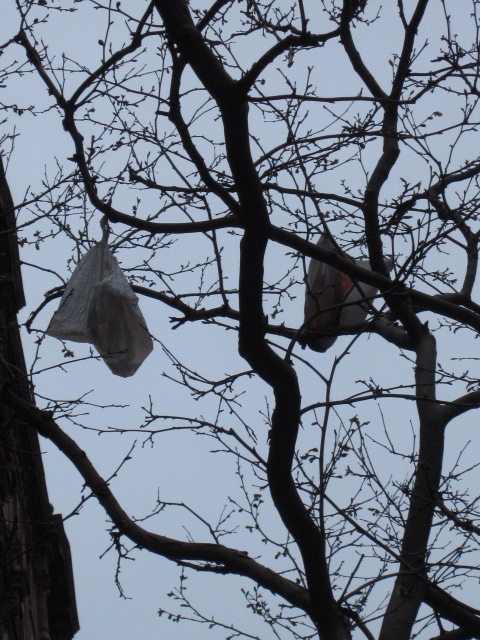 Two Bags in Branches: Don’t you have anything better to do than stalk us? I had news for those bags, I did have something better to do and I was on my way to doing it. 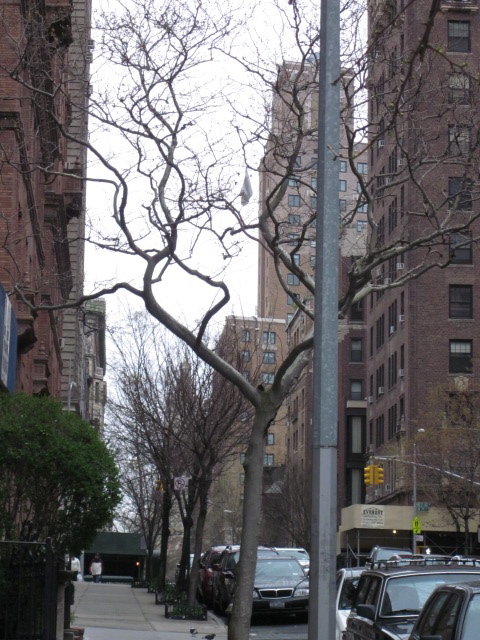 I was hightailing over to Brew York City. 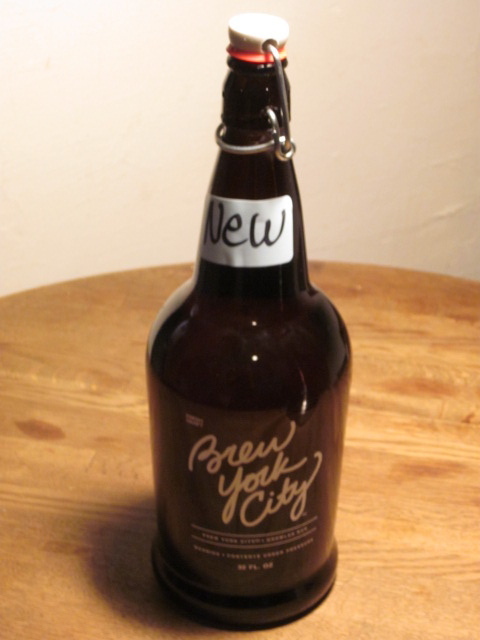 What’s Brew York City? 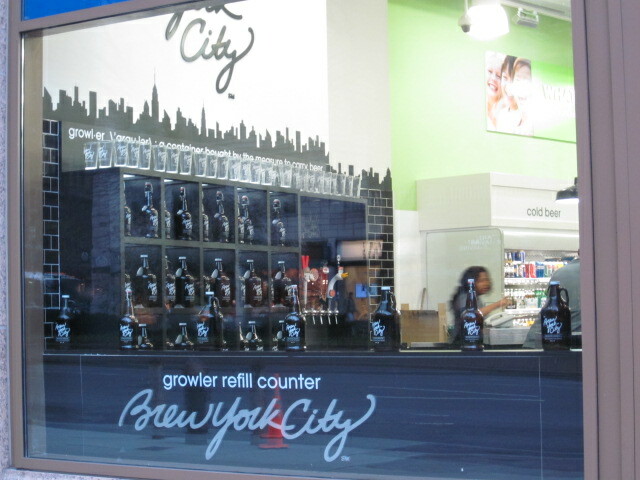 It’s the recently opened growler beer bar located in the Duane Reade at 2148 Broadway between West 75th and West 76th Streets. Since I know absolutely nothing about what a growler bar is and I happen to like beer very much, the time had come for me to check this place out. Once inside I saw nine taps, eight with craft brew beer and the ninth was a cider. Get your fresh beer here now! Lyndon the Helpful was my guide. 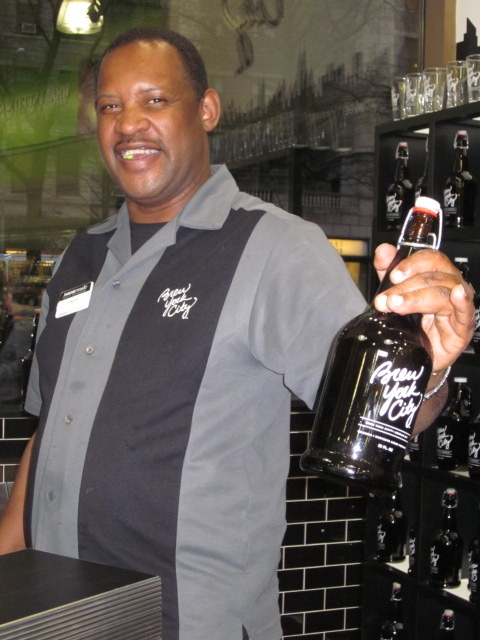 He explained to me that the growlers are the bottles, selling for $3.49 for the 32 oz size or $3.99 for the 64 oz version. 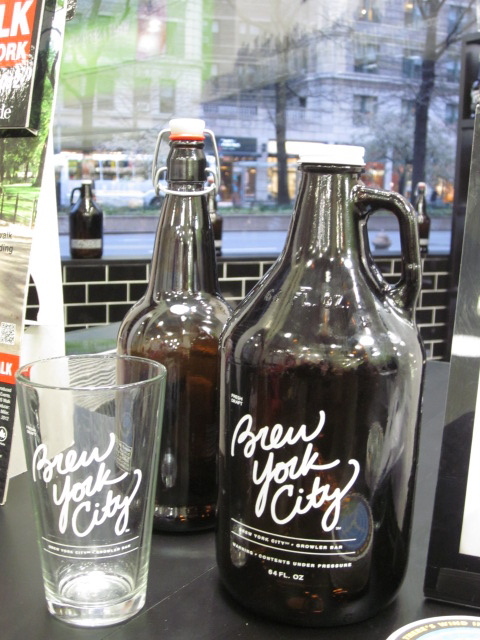 Large and small growlers with logo pint glass. Once a customer purchases a bottle, when he or she returns for more beer, since they already own the bottle, all they pay for are the suds. 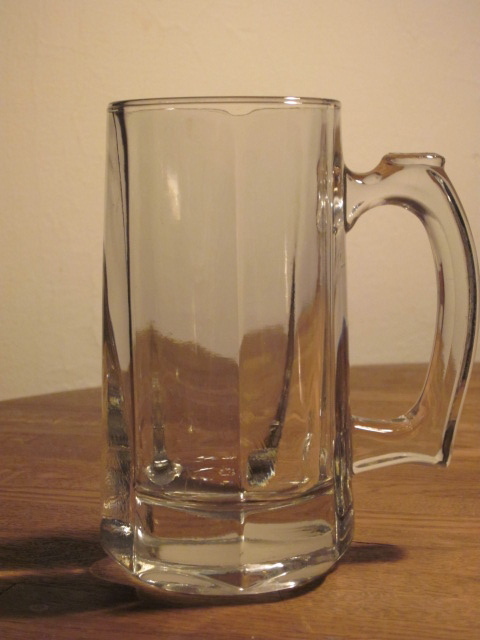 32 oz refills are $5.99 and 64 oz reinforcements sell for $8.99. Works for me. Gimme the 32 oz model. Me: So why do they call the bottles growlers? Lyndon: A long time ago when you bought beer this way and you took it home and opened the bottle it would make a growling sound. Me: But the bottles don’t growl now? Lyndon: No, they don’t growl anymore. Me: Why did they stop growling? Lyndon: The beer’s made different these days. [placating me] When you open your bottle, it’ll pop. Gee, I was hoping my bottle would open with a deafening roar. We change the subject to what kind of beer I should get. I know the beers I like include Stella, Bass Ale, Magic Hat, Sierra Nevada and I know when I was last in this Duane Reade two days earlier for alcohol-free Q-tips they had Brooklyn Lager on tap but that one’s not available today. The taps are refreshed frequently. Pedro the Cheerful: What’s your freshest tap? Lyndon the Helpful: That’ll be the Brew Free or Die IPA. Pedro hands Lyndon his growler. Pedro and I make small talk. He claims that he likes the weather. Can Pedro also like this? Me (astounded): It’s damp! It’s dreary! It looks like fall out there! Pedro the Cheerful: I’m okay with it! Lyndon: Have you decided which one you want? Me: I’ll have what he’s having. 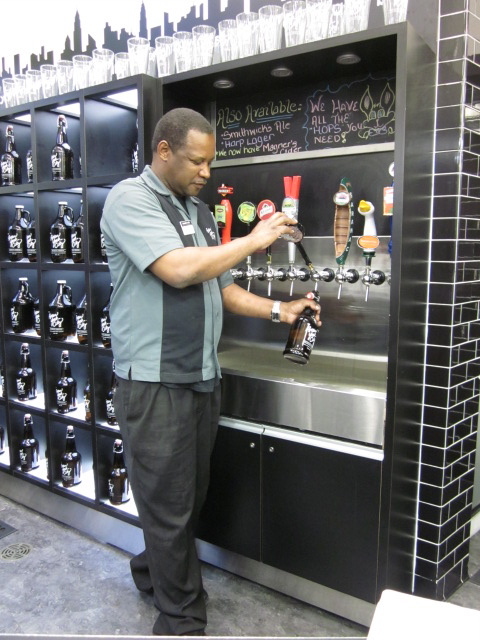 Lyndon the Helpful filling my growler. I decide this simply in the hope of catching some of Pedro’s positive outlook on life. Lyndon holding my quart of happy. Although I could buy a Brew York City glass for $2.50, I resist since I have plenty of glassware in my sanctum sanctorum for my initial taste of this craft brew from 21st Amendment, a brewery located in San Francisco. Before paying, Lyndon urges me to take a slip of paper with the web address for Beermenus.com. Since I have zero confidence in my memory’s capability to recall an address so simple, I heed his advice. 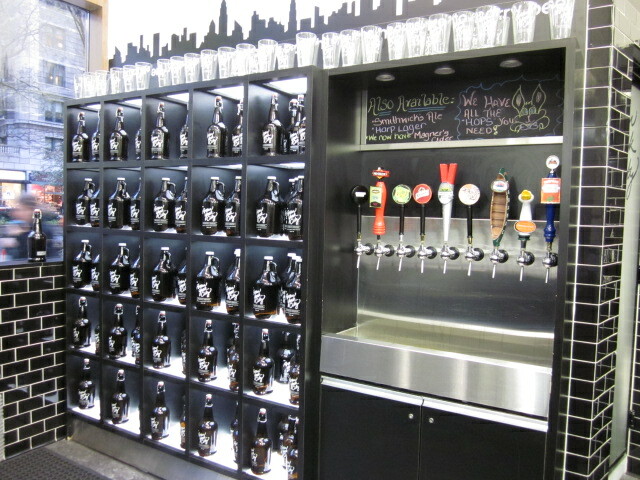 This site has a nice overview of the craft beers available on any given day at various Brew York City locations. 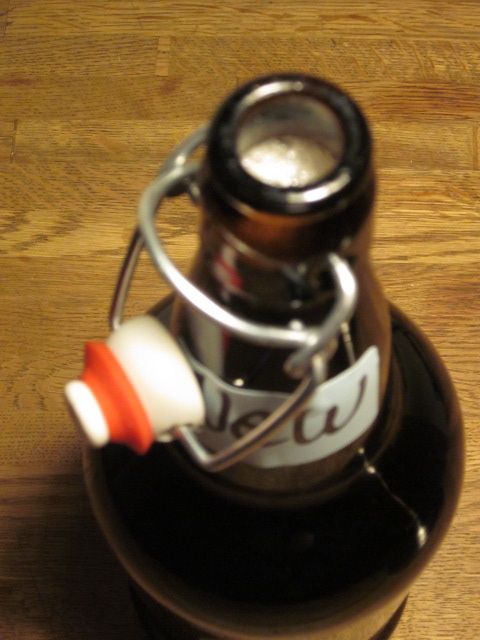 Once home, before I pop open my silent growler I have to decide on what glass to use. New non-growling growler waiting to be popped. Do I go with a glass that reflects my dour personality? 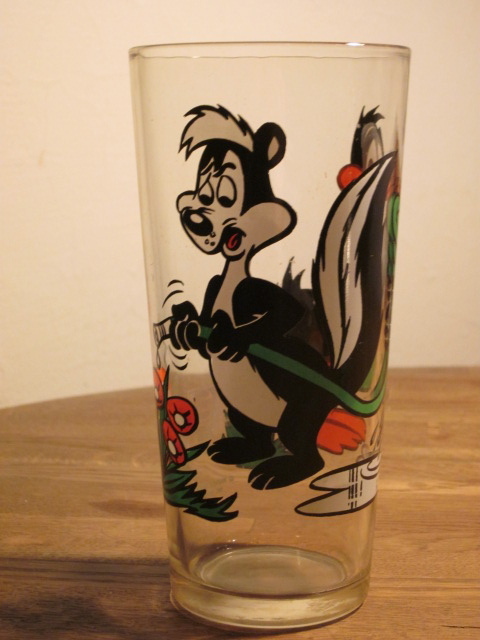 The Pepe le Peu side of a glass. 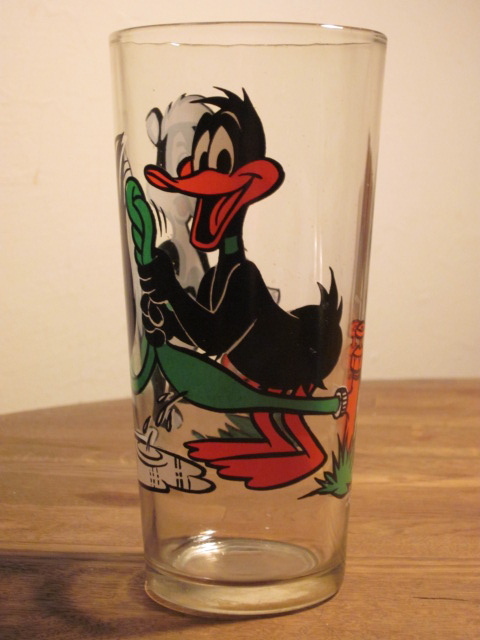 The Daffy Duck side of the glass. Or, should I treat these fresh suds with dignity? Then, I pour my first glass. 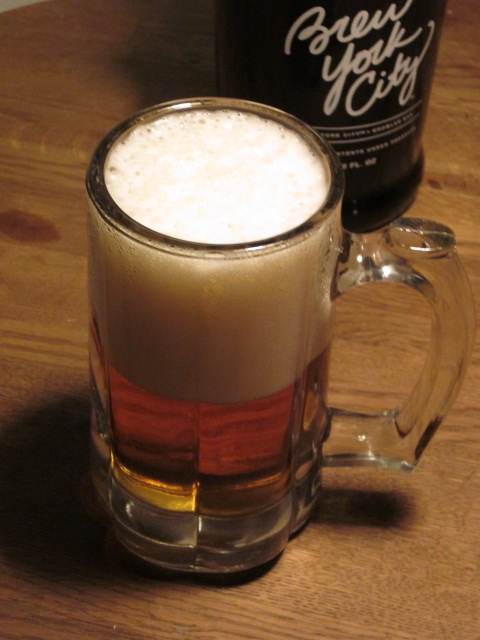 I like the frothy head. Who doesn't love good head? Me: What the hell am I drinking, lighter fluid? Yet, I quickly grow to enjoy this refreshing IPA with its “solid malt background and hoppy flavor.” At 7% alcohol content, it also has a nice kick. $5.99 for a quart of fresh craft beer I can take home in my very own non-growling growler strikes me as a very good deal on what had been a very gloomy spring day. 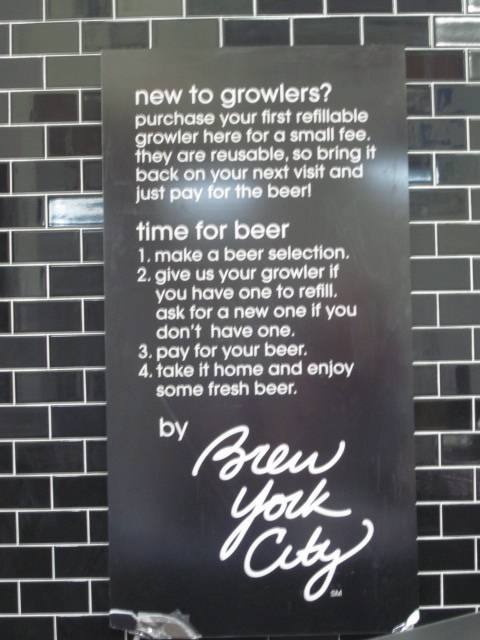 This entry was posted in Humor, new york city and tagged 21st amendment brewery, beer, craft beer, duane reade, growler, growler bar, ipa. Bookmark the permalink. I just bookmarked Beermenus.com. I clearly have my priorities in order this Monday morning. My inner Homer Simpson is so proud to be of such dynamic influence in your life. Sounds like a good time brewing in the Big Apple. Long live lager! Not going to give you much of an argument about good head. 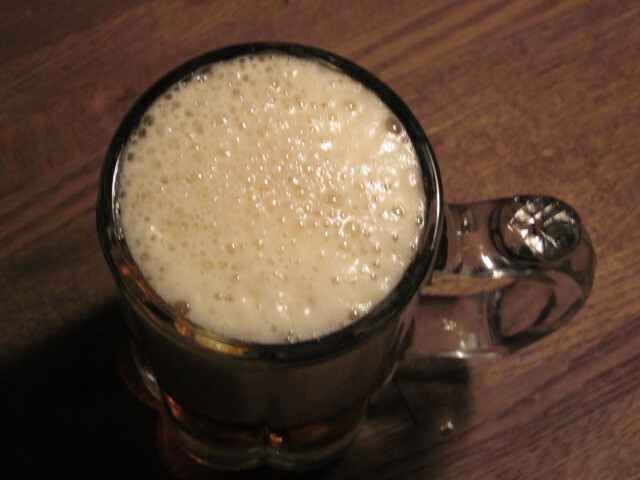 But with respect to its place on a mug of beer, let me say this: I want to amortize the price of a beer by filling the mug with pure liquid gold (or amber, if you prefer) so leave the frothiness in the catch basin. I like the aesthetics of froth. It makes a much sexier image than pure liquid gold. Whenever my buddy, Milton and I pound suds together at any of our favorite watering holes, inevitably he’ll get the pint glass with the froth. Ever the gentleman, he always swaps my frothless glass with his. And soon enough, it does dissolve into liquid gold. What a great adventure! Oh, your city is magical! I love the look of the bottles and the whole ritual of going somewhere other than a grocery store to get some beer. It’s so impersonal and sterile picking up beer stacked next to the display of chips and salsa. This could be my new beer-buying ritual. It was fun and Lyndon’s Mr. Personality.